Senzo Meyiwa, South Africa’s football captain and goalkeeper, has been shot dead in Johannesburg, police say. 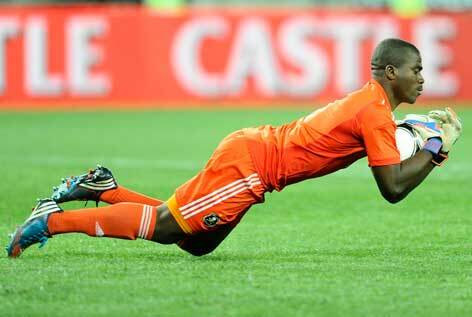 Senzo Meyiwa, 27, was reportedly attacked after men entered his girlfriend’s house in Vosloorus, south of Johannesburg. He played for Orlando Pirates and had played in South Africa’s last four Africa Cup of Nations qualifiers. On October 25, Senzo Meyiwa was in action for his club, when they progressed to the semi-finals of the South African League Cup. In a statement, the South African Police Service said two men had entered the house, around 20:00 local time. A third man remained outside. All three fled on foot after shots were fired, in what local media reports say was an attempted burglary. One of the men had reportedly demanded Senzo Meyiwa’s mobile phone. Senzo Meyiwa was declared dead on arrival at the hospital. “This is a sad loss whichever way you look at it, to Senzo’s family, his extended family, Orlando Pirates and to the nation,” said Pirates’ chairman Irvin Khoza. Senzo Meyiwa was yet to concede a goal in his team’s current run of qualifying games in the Africa Cup of Nations (CAF).